JR went to a family gathering early on this year. She had been talking excitedly to an uncle's cousin's niece's friend's aunt, or something like that, about her forthcoming trip to Scotland. "Och, ya must come ta visit if ya in the area me dear!" JR doesn't even know Morag save for the tenuous link and yet JR is taking up the invitation. 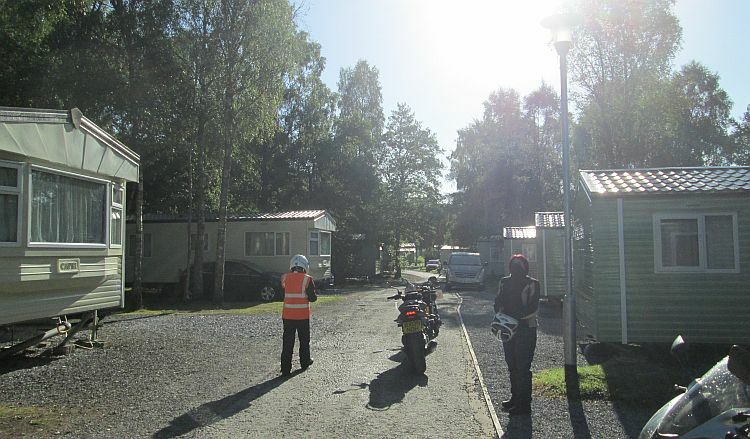 We are to travel from Tummel Bridge to Forres on the Moray coast to spend an hour or so with George and Morag. I have no idea what to expect, they could be nutters, they could be boring or smelly or drunkards. JR seems much more confident that we'll be fine. It's another adventure. I've been to Inverness before but I've never been east from there, this is a new area to me. I do have my reservations though. 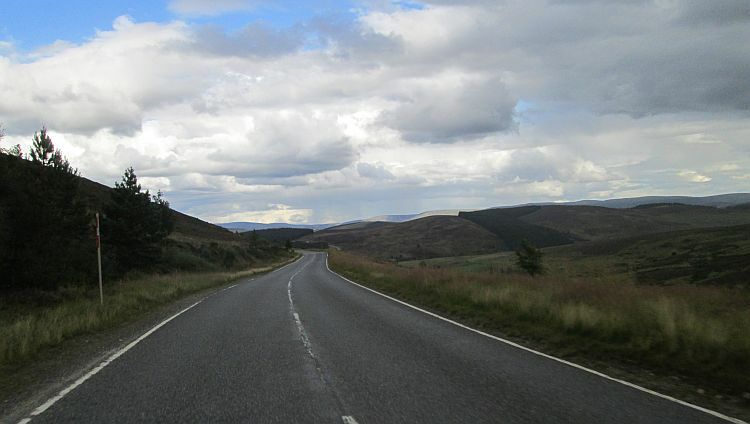 Forres is not the Highlands, there'll be no vast mountains, no awesome roads, no empty lanes and no magnificent lochs. That's what I love about Scotland, that's what I come all the way up here for. We could have ridden over to Skye or if time allowed maybe even Applecross. But no, we're off to the coast, to some little town that will probably look a bit like Southport or Skegness. Pfft. Sun's out! OK lets ride. We do manage to get onto the road at a reasonable time. Unfortunately the first major road is the A9 and as before with the 125 lacking top end speed we are having to be very careful about the frustrated queue that occasionally forms behind us. The gf is giving it all she's got, flat out, throttle wide open, pinned. That allegedly crappy Chinese motorcycle covers the whole 55 miles at full bore, 9,000 rpm. It doesn't melt, it doesn't break, it just keeps on giving and trying, trying and giving relentlessly on and on and on and on. Imagine riding a large Jap bike like a Kwak 600 around an oval track flat out full bore at 160 mph for an hour, would the motor survive? The Keeway's motor does, without complaint and without going under 100 mpg either. Call me impressed. I had been proven wrong about the Ayrshire coast on Monday this week, it appears I am to be proven wrong about the B9007 on this day, Thursday. I was right about this not being the Highlands but I was wrong about it not being amazing. Gone are the green mountains and lochs, this wilderness has a different kind of awesome beauty. I feel as though I could be on the set of an American road movie. There's vast open moor that stretches out all around with mountains in the far distance. The road rises and falls along the contours, slowly twisting and turning here and there. The vegetation is light brown and dark brown with a green tinge. The trees are few and far between, small and windswept. This could be savannah country. Scotland, Or Kansas? Don't care, it's awesome. We ride and ride. JR and RG are far ahead, I'm happy to follow the gf. Her pace is good as the corners are open, visible all around making them easy to predict and prepare for. 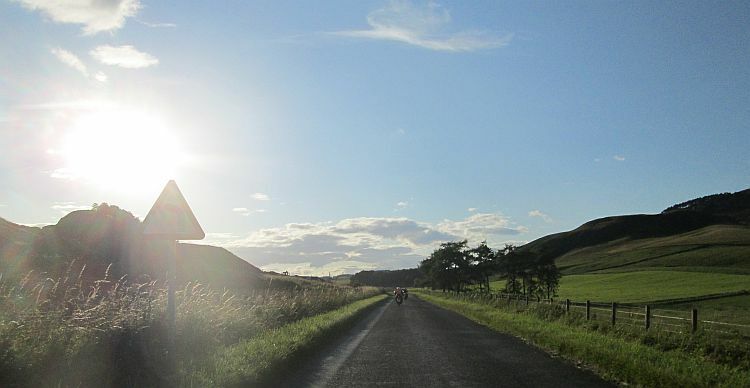 This is a good road to ride, this has to go on my list of roads worth coming back for. On a straight I take a look around and try as hard as I can to fix it all into my mind. This is making memories, this is what I want to recall when I'm old and frail. I rummage for my camera in the tank bag and take snaps as the wind whips the strap around. As we get closer to Forres the road comes back into much greener forest and farmland, I sense we're getting closer to civilisation. Soon enough we're amid the houses and shops of a town. RG's sat nav has got us here but there's some confusion as to the final address. Is it "Close", "Drive" or "Road"? JR checks her phone, we all make some awkward U-turns through the estate and then we fall into a pleasant street filled with smart bungalows. We're here. Morag and George greet us warmly although they're a little bewildered. They've only just this last hour sent the grandkids packing after a week's mayhem and now they're confronted by 4 bikers requiring hot tea, food and entertainment. I feel a little sorry for them. Never the less it's only a matter of minutes before we're sat in the back garden drinking tea, eating ham sandwiches, shading from the sun and all talking like old friends. I admire their energy. George, our host, guide and good egg. George is retired, he keeps his hand in with a little gardening for some locals. He's a man after my own heart too with a garage full of tools and nick-nacks. RG and I take advantage of the facilities by asking for a 27mm socket to adjust JR's sagging chain. This leads to a farcical emptying of cupboards, dropped toolboxes, scattered spanners and Scottish curses before one is found and the job is done. Morag in the meantime keeps the girls engrossed although we're all struggling to unravel her Glaswegian accent. We need subtitles. I would have been more than happy with a brew and a chat. Nope, George whisks us off in the car to show us the delights of Forres. I've "visited" many towns and often they are all the same. 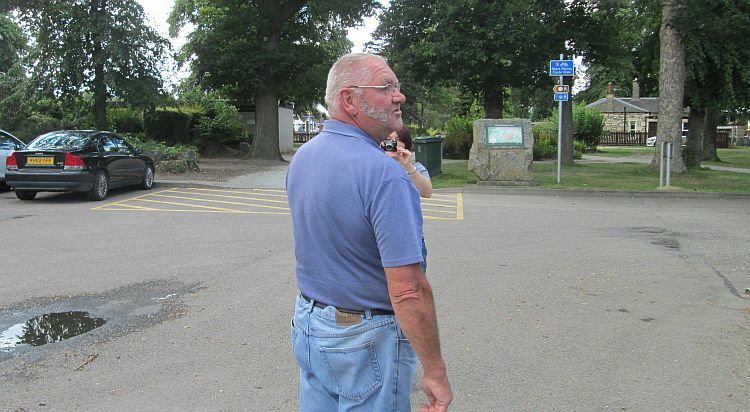 George however brings the town to life with his local knowledge. We first take in the park. 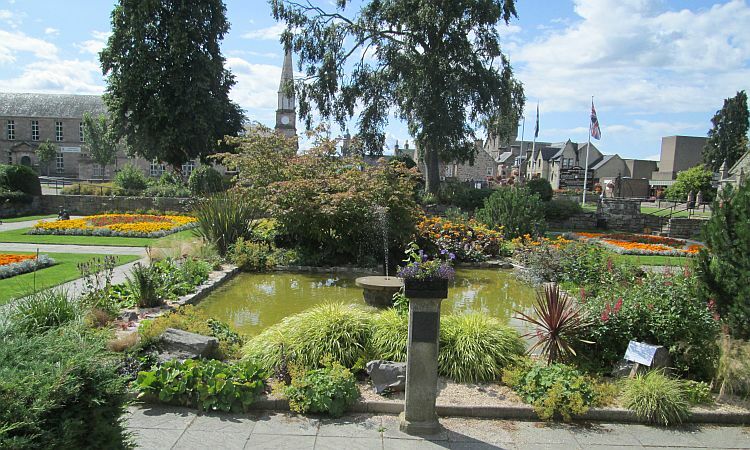 There's flowers in arrangements that create animals, a sunken garden where once a building stood and a sign that declares Forres has won Britain in Bloom and Scotland in Bloom more times than I care to count. This doesn't mean a lot to me but the girls are impressed and even I can see the effort put in. It's not my thing but even I can appreciate the work and effort. 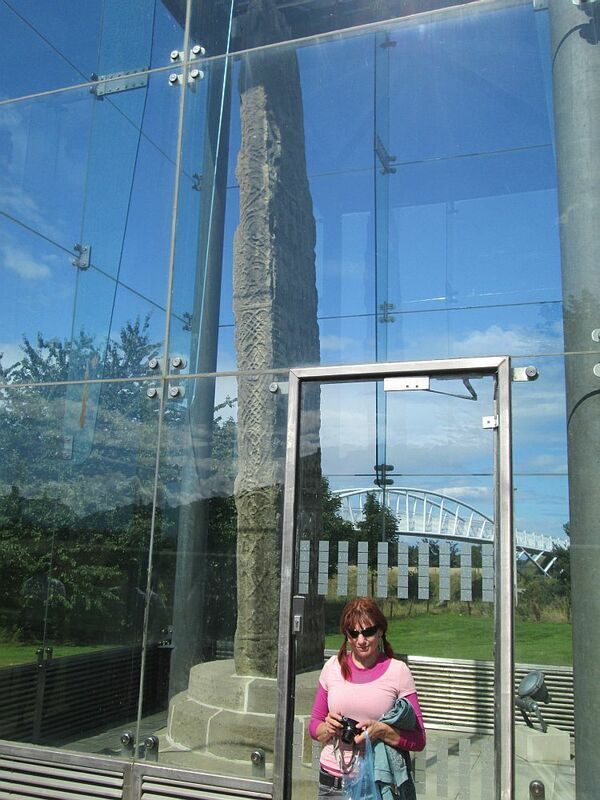 There's a massive ancient stone encased in glass to stop the carvings from being weathered away. The information board admits no-one really knows what the inscriptions are all about but that doesn't stop some experts from guessing. It's not just some little pebble you know, it's mahusive! There's "The Park" near Findhorn which the locals call The Field Of Dreams. 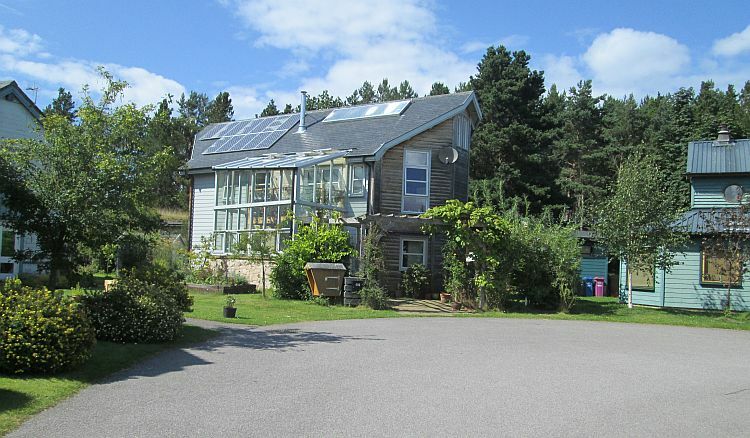 The notion apparently is that all the houses have to be built from recycled materials. Some are quite ordinary, some are plain odd, some are sensibly interesting and some are surreal. This environmental mindset attracts "alternative" types and the paths are lined with trinkets, chimes and wind powered animated curios. Bicycles are the order of the day unless it's an electric car, an old Mercedes or the stereotypical VW camper and 2CV. George appreciates the thinking, he disapproves of the latest phase of buildings as these are corporate money making businesses using the "green" ticket as a way to riches. Recycled, maybe but it's not small, pokey or living rough is it. Finally we stop on the Beach at Findorn, looking over the bay. I hadn't expected to be beside the seaside on this holiday, nor had I expected to be warm in the sun either. We're a little off the beaten track yet there's still ice cream and ice lollies to be consumed, which we do. George insists he doesn't want an ice cream but he's having one anyway for taking us out and about. 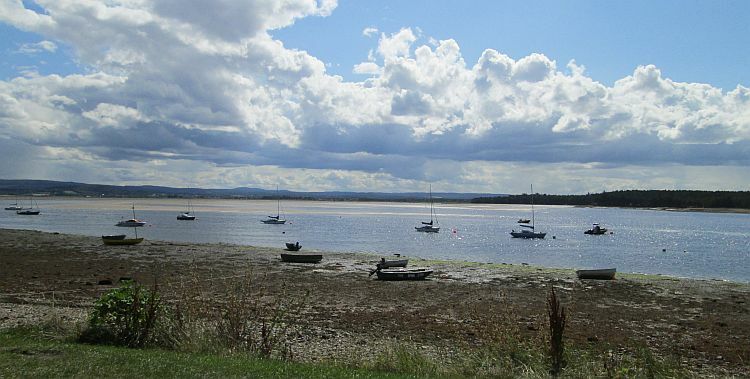 Findhorn Bay. We're beside the seaside, beside the sea! JR gets George to stop at Tesco on the return leg and buys Morag and George some well deserved flowers, they have gone far above and beyond to look after us! Local knowledge is invaluable, we're all left with a real sense of what life is like in Forres and the merits of the pretty town. Our welcome isn't over yet, Morag plies us with tea and cake before we're allowed to leave. My biggest thanks to them both for their warmest of welcomes. 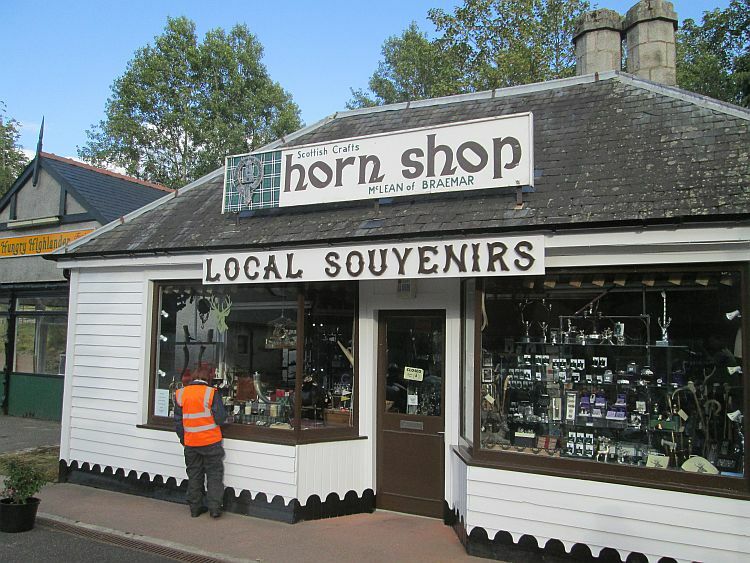 I'm definitely a fan of Forres now, we have to return and explore some more. There's a story behind the choice of return trip, a tale that belies my youthful years. When I were a lad I used to listen to Terry Wogan in the morning. In the winter there was a long running gag about the Postmistress Mrs Mackay whose silver shovel kept the Cockbridge to Tomintoul road open so that the sheep could graze safely. I often imagined a stout lady with tartan skirt heaving away 6 feet drifts at amazing speed while council gritters looked on in awe. Well, now is my chance to see this mythical road for myself. 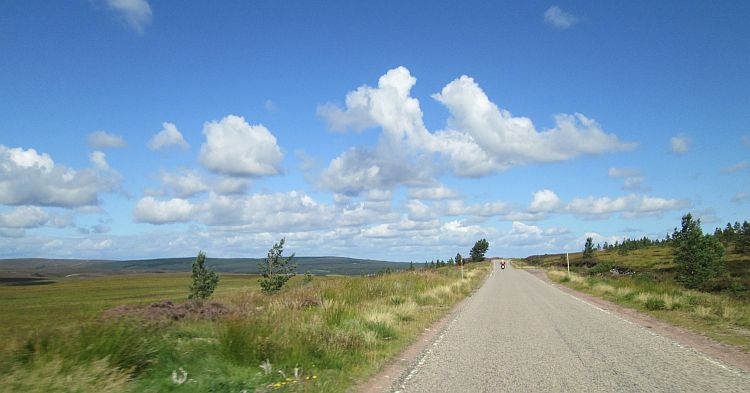 RG's sat nav takes us back through the to Grantown-on-Spey and out to Timintoul. This is it, this is the road in question. It starts out on open moors again, I can see a strong wind blowing thick white snow all around. Then the road rises and rises until we glimpse curious machinery on the hillsides, my goodness, ski lifts! I can see Mrs Mackay working her way up the incline, snow flying from her gleaming shovel, she only stops every once in a while to catch her breath and asses the task in hand. There's no snow, but I am loving this. We're on a way to the Cairngorms. 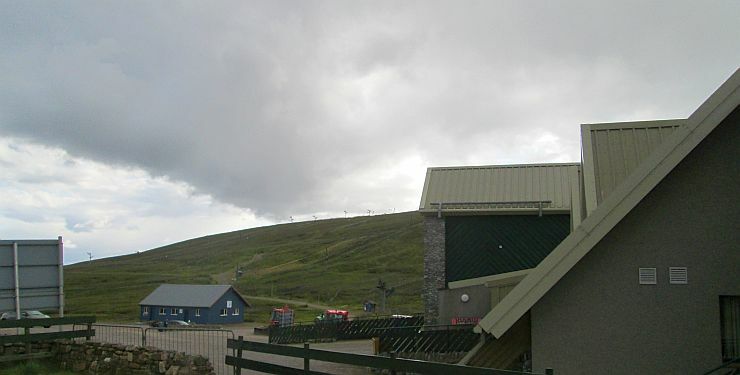 It's odd to see the Lecht Ski Centre. I know it happens yet I find it surreal to imagine anyone skiing in this country as I've never seen it in snow. The vast empty car park, the lodge and the silent lifts. It is all deserted today and there's not a hint of snow. I just can't picture it in full swing with happy smiling skiers and snowboarders all having fun. Strange, I can see Mrs Mackay quite clearly. It's a bit quiet at the Ski Centre. Can't think why. We pass through Cockbridge which is in fact just that, a bridge. I don't know why but I'd expected at least a village. I'm not disappointed as the road carries on through some more vast empty countryside. The hills and mountains are gentler here than the Highlands yet the road remains a great ride and blissfully light on traffic. We roll and rise, turn and fall onwards. I do have an eye on the time though, we're not going to be back to the caravan till much later. We need to keep going otherwise it'll be getting dark. It's been said before, all too often. We stop for a brief rest and a chocolate bar in Braemar. There's a pub that looks inviting but no, no we can't rest too long we must press on, Morag and George's fabulous hospitality has set us back a little. Back on the A93 I pass another place I've heard of many times, Glenshee. There follows another ski resort, empty and deserted although a sign suggests there may be a cafe open somewhere, we don't have time to find out. a few miles later the Spittle of Glenshee refreshes my memory as to why I know that name, it's all too often mentioned in winter traffic reports for being closed. I wonder if there's a Mrs Mackay to keep this road clear too. Thankfully it is closed. No dear, you can't afford it. We turn off for Kirkmichael and finally the A924 promises to take us to Pitlochry swiftly and safely. A look at the clock and a mental guess of maybe another 30 miles means I can relax, there's plenty of time to get back before dark. The dark isn't really a problem as such but on these squirming and writhing lanes progress will be slow with only headlights to illuminate the gloom. I don't want to miss anything either. Each turn and each corner reveal another view that I want to treasure forever and the scene is slowly changing from vast Cairngorm rollers to angular Highland peaks. Mind you, I'm getting tired now, it's been a long day. Almost home, the A924 will get us to Pitlochry. To cap off a long ride RG's sat nav leads us a merry dance into Pitlochry. We're down a dirt track past a golf club, up behind some stone mansions then around the sharpest steepest switchback you could hope to see. RG takes it in his stride, JR however decides this is scary and wobbles into it then target fixates onto a 4 by 4 that's coming uphill. She misses it by inches as the driver looks on agape at the screaming lady rider that passes his window. The gf has an easier time on the tiny 125, she looks positively in control. She admits later she was bricking it. Finally we're all back at the caravan safe and sound. It's been another excellent day out, Morag and George were the icing on a delectable cake. I have been very impressed with the Cairngorms, I didn't expect to be. I've also been very impressed by the pretty yet lively town of Forres and the gentle yet warm lifestyle there. I've had my eyes opened to the "other" bits of Scotland this trip, the Highlands are amazing but so is the rest of this country it seems. The gf and I are jealous, we ponder if we could move here. Another great account of your travels Ren.